You are cordially invited to fish in the 2015 Salmon Quest to be held Saturday, April 11th, on the rivers in and around the Portland area. The day of fishing will be followed by a bbq dinner, awards ceremony, and silent auction at the PDX Holiday Inn, 8439 NE Columbia Blvd. in Portland. The Northwest Steelheaders offers this opportunity for the sport fishing community to give back to the resource. Proceeds from the tournament are used to improve sport fisheries through on-the-ground restoration and access projects in the Willamette and Sandy river basins. 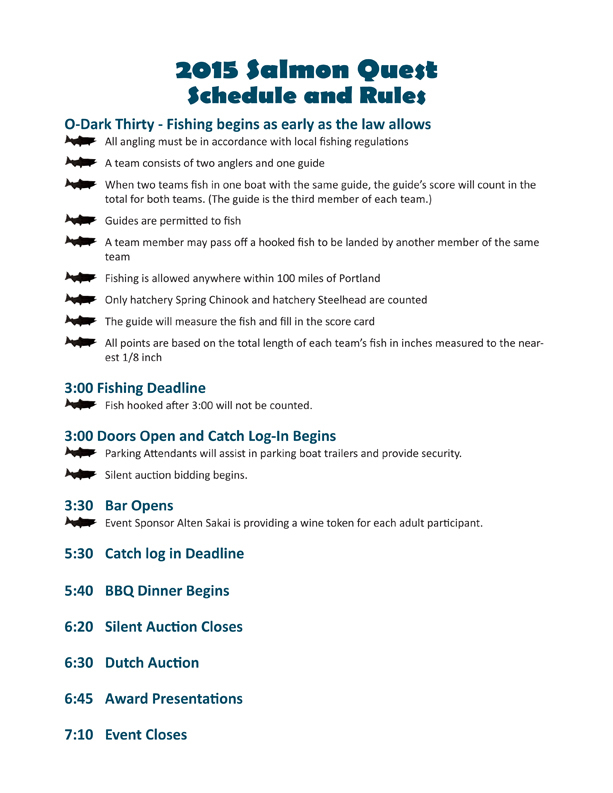 Registration is $250 per angler and includes a day of fishing with a professional guide or experienced boatman, commemorative gift, dinner, awards, and silent auction. Fishing is in teams of two anglers and one guide with the top three teams and biggest fish winning Salmon Quest trophies. Four anglers may fish in the same boat as two teams with the guide being the third member of each team. The guides will furnish the boat, fishing gear and bait. Anglers may bring their own guide or select from our list of professional guides and experienced boatmen who donate their time and resources for the event. You may fish any legal waters within 100 miles of Portland. Your pictures taken throughout the day could win prizes as well! Past Quest funds are being spent to greatly expand volunteer participation in steam nutrient enrichment. In 2014 we purchased a freezer trailer to allow volunteers to throw excess hatchery salmon carcasses back in their local rivers to provide food and nutrients for young salmonids. New and expanded acclimation ponds to improve hatchery fish catch rates and other projects are being planned if we can generate the funding. Thank you, past Quest anglers, for making this great project possible! We look forward to seeing you at the 2015 Salmon Quest!